This technical article covers biotic powers in Mass Effect — the first game — adapted to the DC Heroes and Mutants & Masterminds 3rd edition tabletop role-playing games. Biotics are a set of psychic/psionic powers. For more context, see our general Mass Effect I setting article. The article also assumes that you know how Mass Effect I kinetic shields function (see the Mass Effect I weapons locker). Dialogue in the game indicates that biotics have broader, more flexible applications than the “spells” used in the first Mass Effect game. For instance, Kaidan Alenko describes a biotic training exercise as telekinetically fetching a glass of water (the goal of the exercise presumably being not to spill water). 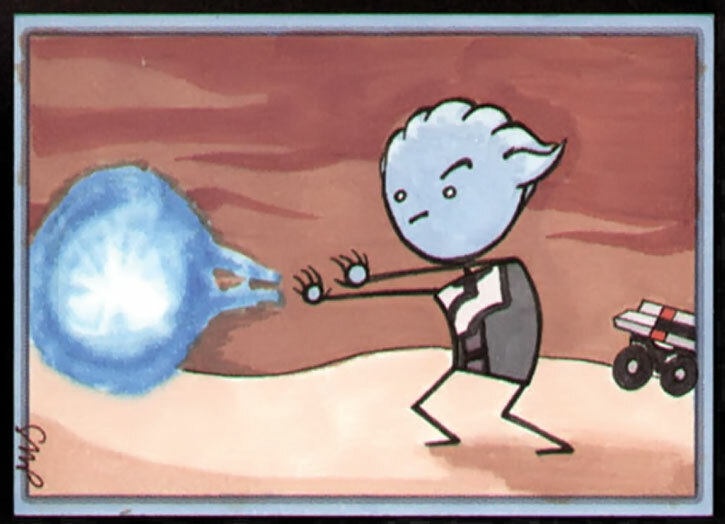 Codices and other sources lead to the conclusion that biotics have a low level of general telekinetic power that includes remotely moving objects and generating disruptive fields. Trained biotics presumably focus their exercises on performing specific tasks with a much higher level of power than their “general” telekinetic abilities. These correspond to the in-game powers. Biotics using their abilities will be shrouded in blue energy manifestations flowing around their body. This “Dark Energy” is energy that has been attuned to Element Zero and is starting to resonate with it to generate a Mass Effect field. “Dark energy” is the jargon used in physical cosmology about hypothetical energies that can’t be detected directly (though dark energy interacting with Element Zero can most definitely be detected). The radiance is not normally a problem, but in DC Adventures the GM might agree that this constitutes a Quirk, as it makes staying hidden difficult. Biotics usually have very low power… unless specialised cybernetics are implanted. These implants allow them to route a greater flow of energy through the deposits of Element Zero in their bodies, and with greater efficiency. 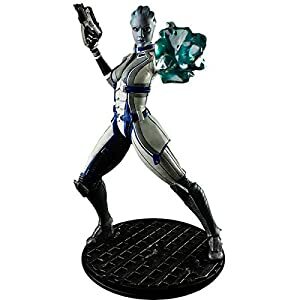 Almost biotics in the game have such implants, the main exception being Asari – whose very sophisticated nervous system can handle enough energy au naturel. Human biotics of the first generation (like Staff Lieutenant Alenko) have L2 implants which were an early high-risk, high-reward design. Successful L2 biotics can be quite powerful, but L2s always include numerous side-effects and many L2 subjects descended in insanity, chronic pain, personality alteration and various physiological and psychological disabilities. L2 biotics tend to be in their early 30s. The new generation (in their mid-to-late-20s as of Mass Effect I) was implanted with L3s, which do not produce the rare powerful subject but have much less severe side effects. In game terms, the implants are just fluff – they are done during childhood and are not generally upgraded (the surgery is much too risky). Though there are statistical trends that hold true for the entire L2 or L3 population, they are not important for individual characters. Some biotics (particularly in the military) further use bio-amps – small modules that can be implanted in the body to help channel energy in a certain way. Humans have those surgically plugged into their biotic implants, but this is a much less serious and invasive operation than getting a biotic implant. It is apparently possible to have them installed, removed, upgraded, etc. as an outpatient procedure. Since the best bio-amps are built by Asari companies, other races presumably use adapter cradles so Asari wetware can be connected to their implants. In DC Heroes, a 2-point Misc. Advantage giving a +1 bonus to the final die roll (like the Dart Bonus) to a specific biotic Power. Higher-end implants can provide bonuses to several Powers (so they have the Advantage multiple times), and the highest quality (Serrice Council Savant X amplifier) provides the bonus to all known Powers. In DC Adventures, Advantages (like Power Attack or Extraordinary Effort) with a Limited 1 Flaw (Only for Biotics). The bio-amps are not considered Removable in game terms. The Mass Effect novels by Drew Karpyshyn give examples of biotic powers free from the constraint video game play. This is the version of biotics as envisioned by the main writer, rather than what was actually produced in the game. Most biotics have the juice to produce maybe 2 or 3 biotic effects before they run out and need rest. Significant use of biotic powers is in DCH terms Minor Marginal for the first two uses, then the costs ramp up with each successive use (in DCA, use some sort of Fatiguing Flaw). Using a given power for a extended periods seems to represent the same sort of fatigue as running a high-level marathon. Furthermore, biotics need to “catch their breath” between power uses – they cannot chain effects. A common Limitation would be 4 Phases minimum between two biotic manifestations, though GMs might allow for Hero Points spending (DCH)/Extra Effort (DCA) to recover faster. Biotics need some buildup time to prepare a charge. This is not as constraining as it sounds – a well-trained person needs only 4 or 5 seconds, and untrained observers will probably not notice the telltale signs of dark energy buildup (OV/RV of 06/06 for those unfamiliar with biotics, 04/04 otherwise). In DCH terms it mean a Phase of preparation before using a Power, then using it at the normal Initiative rank during the next Phase. During the preparation Phase the biotic can still talk (for instance to stall for time), walk slowly, etc. A well-trained biotic using a throw effect can kill an armoured person in one blow, or lift hundreds of kilos in one burst – but these seemed to require extraordinary effort (i.e., Hero Points). Exceptionally powerful biotics like the Krogan battlemaster Skarr , or the Human Gillian Grayson , could throw multiple tons. Skarr is seen flipping a 4-ton APC a dozen meters with intensive concentration, and Gillian uses a forklift truck that weighed at least 2 tonnes as a missile. A low level of telekinesis (Telekinesis in DCH, Move Objects in DCA) is apparently accessible to all biotics. However it is apparently always less powerful than codified, rehearsed attack manoeuvres. GMs may want to make the Power rapidly more expensive to buy past one or two Ranks/APs. Biotics are seen in-game flinging large objects at enemies – but this is using the Throw ability on a suitable and well-placed object, not Telekinesis/Move Objects per se. It is possible that most biotics can also generate some raw destructive force – a small molecular disruption field that is essentially a spontaneous version of the biotic warp technique. This would be a tiny amount of Disintegration (DCH) or Damage with a Disruption Descriptor and some Reach (DCA), but there is very little support for that hypothesis. The codified, rehearsed attacks are described below. Remember that in the first Mass Effect game biotic attacks are not generally stopped by Mass Effect kinetic shields, which work against small high-velocity objects, but are resisted by Hardening. Throw is a focused wave of gravitic force that picks up and flings away everything in its wake. A powerful biotic can produce a wave that is several metres wide and applies force in excess of a thousand newtons to what is in its wake. A newton is enough force to move one kilogram at one metre/second, so such a Throw would propel back 100kg persons at 10 metres/second (about 36 km/h or 22 mph). This is not enough acceleration to inflict damage on its own, but colliding with walls (or being hit by objects) at this speed certainly is. All objects caught in the blast receive the same amount of force – the newtons are not divided among the objects being affected. To repel melee opponents closing in. To dispose of enemy cover (quite possibly ramming them with whatever they were hiding behind). To force enemies into dangerous terrain (such as off a cliff). To destabilise powerful opponents and keep them out of the fight as they recover from having been thrown, etc.. Throw is the Superbreath Power, with usually 2-6 APs. Most biotics have a Limitation (FC -1) that they can only use this Power every other Phase. Throw is a Move Object Effect, with Limited Direction 1 (only directly toward or away), Quirk 1 (eliminating the “directly toward” option), Limited 1 (can only be used every other round) and a Line Area. A very powerful biotic would have Line Area 4 on their Throw (10 feet wide and 60 feet long), whereas most biotics have Line Area 1 (5 feet wide and 30 feet long). Lift is a vertical grip of Mass Effect force. The target is wreathed in coruscating Mass Effect energy holding them fast, and helplessly lifted a few metres in the air for several seconds. More powerful biotics can affect everything within several square metres. Lift is useful to keep a particularly dangerous opponent out of the fight for a while, but is chiefly used to turn an opponent into an easy target so that gunfire (or perhaps other biotics using Throw) can dispose of them. Even if the target was behind cover, the Lift will usually expose them. In Mass Effect Lift is something of a fire-and-forget process that lasts for about 5 to 15 seconds depending on power. To adapt to tabletop RPGs, the mechanics below describe an ongoing process where the target can attempt to struggle free and where the attacker may only partially succeed. To Lift a target, a Character must make an Action Check using the APs of Biotic Lift against the target’s DEX/STR as the OV/RV. In campaigns where Powers are not generally their own AV, most Characters will use an Accuracy (Biotics) Skill. Joined can be used to increase the RV of the target. They lower the Initiative of the target as long as Biotic Lift is applied. They increase the OV for all Checks the target may attempt (though the GM may rule that certain actions are not disrupted by the Lift). Even one RAP prevents the target from using ground movement Powers (such as Running, Jumping or Superspeed) as they no longer touch the ground. For Powers such as Flight, the RAPs get subtracted from this Power’s APs. If positive RAPs have been scored, the target is lifted 0 APs of distance into the air. It is possible to use RAPs to increase this distance, but these are RAPs are no longer usable to increase OVs, and the weight of the subject lowers the distance (though it cannot bring the distance below zero). If the target collides with something (e.g., a ceiling) they take damage against their BODY/BODY, with the attacker using the RAPs used for lifting distance as the AV/EV. Each RAP used to increase the distance from the ground also lowers the weight of the target by 1 AP. Example: A Character uses Biotic Lift and gains 6 RAPs again their target. The target’s Initiative is lowered by 6 and all OVs increased by 6 as they struggle against being wrestled by a Mass Effect field. The Character wishes to lift the subject higher, and shifts 4 RAPs from increasing OVs to lift distance. The target now only has a +2 penalty to their OVs, but rise in the air to a distance of 4 APs minus their weight – or about 30 or 40 ft. assuming an average human. If there is an object in the way, the target is attacked with an AV/EV of 04/04 against their BODY/BODY — and the target is treated as weighing minus one AP. The target can attempt to break the Biotic Lift using STR/STR against the RAPs/RAPs gained that Phase. Biotic Lift only lasts one Phase – it must be re-applied with a new Dice Action on each subsequent Phase where it is used. 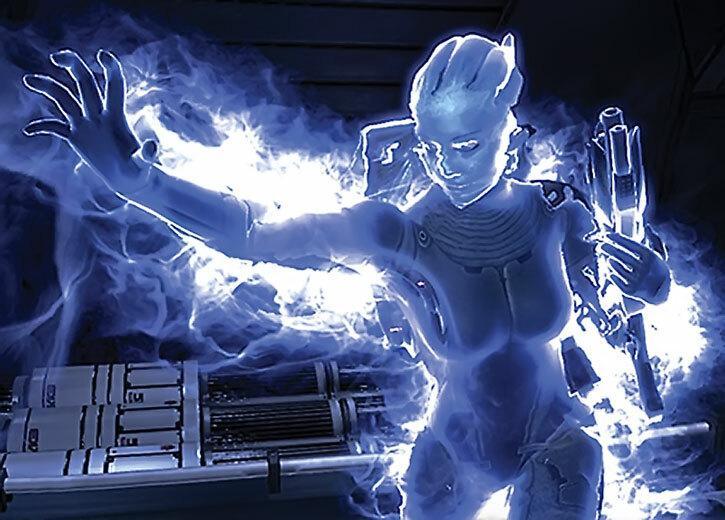 Like with Snare and other Powers, the GM is encouraged to allow other AV/OVs to break the Biotic Lift – such as Telekinesis/Telekinesis, Flight/Flight, Fluid form/Fluid form, etc. Biotic Lift is an Affliction with the Extras Ranged and Extra Condition x2, the Flaw Limited Degree, and Resisted by Dodge. The Conditions for one degree of success are hindered, vulnerable, and illuminated (the character can be targeted without Concealment penalties, and their mass is treated as being one Rank lower). The Conditions for two degrees of success are immobilised, defenceless and lifted (each degree of success lowers the mass of the target by one Rank whilst the effect is active, the target can be targeted without Concealment penalties, and the target is lifted upward as per the effects of one Rank of Move Object). Biotic barriers are the natural equivalent of kinetic shields, but with a much rawer aspect. They protect against the same types of assaults (chiefly small, fast projectiles) but whereas a shield is invisible, barriers are a coruscating field of Mass Effect energy covering the biotic person. Furthermore, barriers can only be manifested for a few seconds (usually 6-10 seconds, though very powerful biotics can maintain a barrier for more than 20 seconds) and do not appreciably replenish their capacity when damaged. To keep the notation brief and avoid confusion, it is simpler to describe biotic barriers as a power of their own. Biotic Barriers automatically defend against ranged Physical Attacks with a mass-at-rest of, arbitrarily, less than 400 grams (14 ounces). They do not normally offer protection against other attacks. Biotic Barriers always have a RV of 03 against these attacks. The APs of Power act like Damage Capacity – these are the “hit points” of the kinetic shield, its BODY Condition. Once the Current Condition of the barrier has been reduced to zero it stops protecting. The attack that reduced the Shield to zero can attack what the shield protected, but its EV will be reduced by as many APs as the RAPs it inflicted to the Shield. Biotic barriers can only be maintained for so long – they automatically lose 5 APs at the end of each Phase during which they were active. This is cumulative with any APs lost through attacks. Furthermore, biotic needs time to rebuild the specific sort of charge needed to summon a barrier. The charge-rebuilding time is not affected by most Recovery mechanics (such as Regeneration) though allowing a Desperation Recovery sounds reasonable in most Genres. This recovery delay depends upon the APs of Power. Players are encouraged to keep track of how many Phases are left using a d10 as a display if it is proving confusing. Unlike artificial kinetic shields, Biotic Barriers do not generally regain capacity while they are active. Notes: The same notes as with the MEKx Shields Power apply – APs of this Power will usually be much higher than other numbers on the character sheet since those are “hit points” rather than traditional APs – and fairly brittle hit points at that. Plus, biotics tend to have more APs than armours have kinetic shields. As with kinetic shields, if keeping track of the Current Condition is a bother, use 2d10 or a small solar-powered calculator as a display for the current number. Biotic Barriers are a Protection Effect, with a Limited Flaws (they protect against the same sorts of attacks as kinetic shields) and the Fade Flaw. Given these important Flaws, most campaigns will allow them to exceed PL limits by 4 or 5 Ranks. A Warp is a spherical Mass Effect field that weakens molecular bonds. It has a corrosive effect, damaging equipment and personnel subjected to it. Rigid materials (such as armour) become easier to shatter as a result, which has been compared to exposing metals to intense cold to make them brittle. Warps do not affect kinetic shields, though – they’re not projectiles. Warp is occasionally used for interdiction, for instance to block a corridor. While it is possible to cross it and most warps won’t kill an armoured person, most people would rather not jump into a molecular disruption field — and it is sensible to suspect the presence of a sniper ready to shoot persons whose body armour is being scrambled by the warp. Warp is more often used on stationary opponents, such as opponents pinned under fire, under cover as suppressive fire rage around them, thrown en masse by a biotic into a corner, turrets, ambushers, etc. As the enemy gets weakened and wounded by the warp field, a follow-up assault such as a grenade will have its effects magnified – or the enemy may be forced to abandon the position affected by the warp. The most common use of warp may be to destroy obstacles, cover and the like – it can be done from a distance, it’s less noisy than explosives and doesn’t require careful placement, it can eat up through a lot of things given enough time, etc. 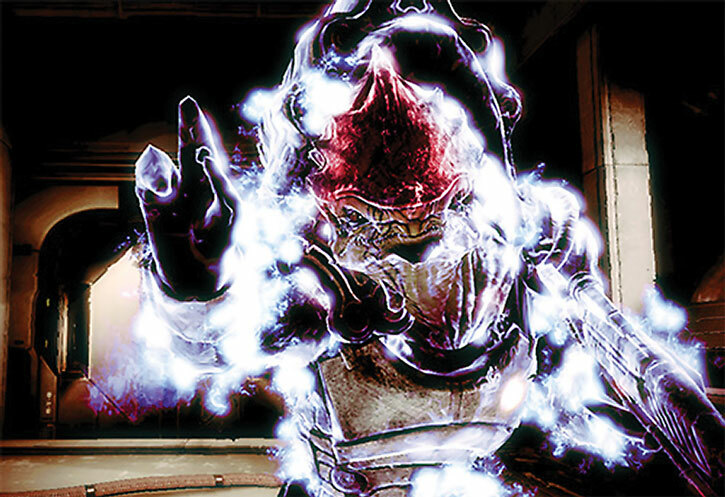 In the video game, warp is a fire-and-forget brief-lived effect in order to keep the tempo up. The version described for DCA and DCH, however, is a maintained effect that keeps the biotic person busy. A Warp is a combination of two basic effects — Sharpness and Acid — with various Bonuses and Limitations. In order to keep notation brief and avoid repetition, let’s package it all as one Power. An Acid effect using the full APs of Biotic Warp, as lowered by the Explosive Radius. This effects attacks BODY/BODY rather than DEX/BODY. The RV of all objects and persons within the Biotic Warp is lowered against Physical and Energy Attacks that have some sort of impact component, such as a bullet, a blaster or a punch. Powers such as Acid and Cell Rot, attacks targeting Mental or Spiritual Attributes, etc. do not normally benefit from this effect. This RV reduction is equal to 1 for every 3 full APs in the Biotic Warp power, and is diminished by the Explosive Radius. Maintaining a Biotic Warp requires full concentration – all Actions are consumed for each Phase during which the Warp is active. Both the field and the biotic person can move slowly without breaking concentration, with a ground speed of 0 APs. Once a Biotic Warp is interrupted, the Character must expand a total of 2 Dice Actions and 4 Automatic Actions to rebuild their charge and create a new Biotic Warp. A Biotic Warp is a Power that includes two Linked Effects – Damage (with a Molecular Disruption Descriptor) and Weaken (with the same Descriptor, attacking Toughness, and the Affect Objects Extra). These Effects both have the Burst Area Extra, and a Limited 1 Flaw (once a Biotic Warp field is interrupted, the character must spend two Standard Actions and two Move Actions to rebuild enough of a charge to reuse their Biotic Warp Power). 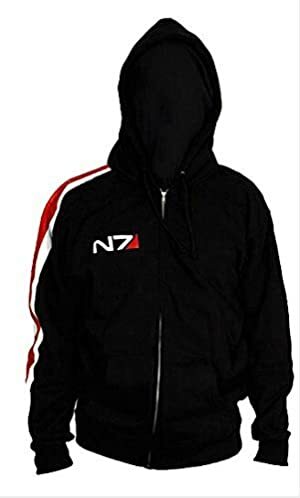 Stasis buries a specific target in a Mass Effect field, freezing them in place and making it difficult for the outside world to affect them. It essentially shuts a person out of the battle, though it can have other, very situation-specific uses (such as saving somebody from being run over by a car). Stasis is typical video game “crowd control” ability. The version described below for DCH and DCA is less binary – it has more nuanced effects and is much more likely to only partially work, though it may also last longer. Space is not so much frozen around around the target as it is heavily distorted – everything is slowed down and follows illogical and discontinuous trajectories as mass and space rotate randomly. A Stasis is not unlike Glue, but the RAPs also hinder and protect the target. In order to keep notation brief and avoid repetition, let’s package it all as one Power. When using Biotic Stasis, the Character makes an Action Check using the APs of Powers as AV/EV against the target’s INT/WIL as the OV/RV. Positive RAPs indicate that the target cannot move until they break free – they can try to act, but not to walk, run, fly, jump, etc. Furthermore, the OV/RV of all their Actions of the target is increased by the RAPs of Biotic Stasis plus three (3), as are the OV/RV of all Actions affecting the target. In order to break free, the Character caught in a Biotic Stasis must make a successful Action Check (i.e., gain one or more RAPs) using INT/WIL against OV/RVS equal to the RAPs gained by the original Biotic Stasis attack. Biotic Stasis is an Affliction resisted by Will. It has the Concentration and Extra Condition Extras, and the Instant Recovery Flaw. Biotic Stasis further has an unusual Limited 1 Flaw — each degree of failure also grants an increasing degree of protection to the target. One degree – the target is hindered and dazed, but all their defenses are increased by three while the Affliction lasts. Two degrees – the target is immobile and attack-disabled, but all their defenses are increased by six while the Affliction lasts. Three degrees – the target is paralysed and unaware, but all their defenses are set at 12 while the Affliction lasts. Singularity appears to be an advanced technique, as it is only used in the game by specialised, powerful biotics (Shepard as an Adept) and a well-trained Asari academic (Dr. Liara T’soni). It creates a small, short-lived gravity well – anything that isn’t nailed to the floor will be sucked toward the centre of the well, unless it’s too heavy for the biotic to meaningfully affect. A biotic singularity is too small and volatile to damage what reaches its centre – in fact one suspects that they do not last long because the mass that gets dragged into the singularity rapidly exceeds the power limit of the biotic, who has to let go of the Mass Effect field. Singularities are not deployed in the battlefield with any regularity, except presumably by Asari warbands – and there are better tools to get rid of attackers in most circumstances (such as a Throw technique). However, in a typical firefight where both parties are hugging cover, a well-placed singularity can draw several enemy combatants into the open, hurling them in a pile with whatever was dragged into the gravity well. Grenades, automatic gunfire, biotic techniques with an area of effect, etc. can then terminate the exposed enemy. Note : This description of Singularity (and the rules below) is based on the descriptions in the game fluff. In-game a singularity behaves more like an area-of-effect biotic lift, shoving everything light enough in the air and letting them drift helplessly for a while. It seems possible that the in-game mechanic couldn’t be fully implemented for release, given how the in-game fluff describes something more intricate. Attraction is toward a point within Range that the character can see (+10 Base Cost). Attraction has an Explosive Radius (+1). Attraction/Repulsion has a Serious Power Burnout (-2). If multiple items and characters are dragged into the singularity, damage may ensue from collisions – heavy objects are heavy, and small objects will be fast. An AV/OV equal to half the APs in Attraction/Repulsion and pitted against BODY/BODY is a good rule of thumb. A Singularity is a Move Object with a Limited 1 Flaw (only toward a specific point with Range) and a Burst Area Extra. It is Linked with an Affliction (resisted by Fortitude) with Limited Degree ; one degree of failures leaves targets hindered, and two leave them prone. The Ranks in Affliction are usually higher than in Move Object. Source of Character: Mass Effect (first game). Helper(s): Pawsplay and Jack of Spade for several bits of DCA mechanics ; Darci, Roy Cowan.